In framing, there are generally four types of glass available to you: Standard Clear Glass, UV Protective Glass, Ultra-Clear (non-reflective) Glass, and Museum Glass. What is your budget? What is the value of the piece (monetary and sentimental) that you are framing? Where are you going to hang and display this piece? The most budget friendly choice when framing. Standard glass provides a barrier from a world of dust and grime for your piece. It works well in environments where this not a large amount of natural light and in rooms that generally have more subdued lighting, this is due to the reflective nature of the glass, it can be quite extreme in very bright rooms, particularly if hung in the direct path of sunlight, it also provides the least amount of protection for your piece. Boasting a 99% UV filtering quality this glass is what is used as a base level for all conservation framing. It ensures that your piece is protected from the damaging effects of UV radiation. This is useful for all pieces with significant monetary value, personal value or for pieces which are not easily replaced. Despite it’s UV filtering, it does not offer anything in the way of anti-reflectiveness, it as susceptible to being overly reflective as standard glass, that said, if not hung in direct sunlight this issue can be mitigated and you may find that this glass serves your purposes best. Virtually reflection free with a 70% UV filtering quality. 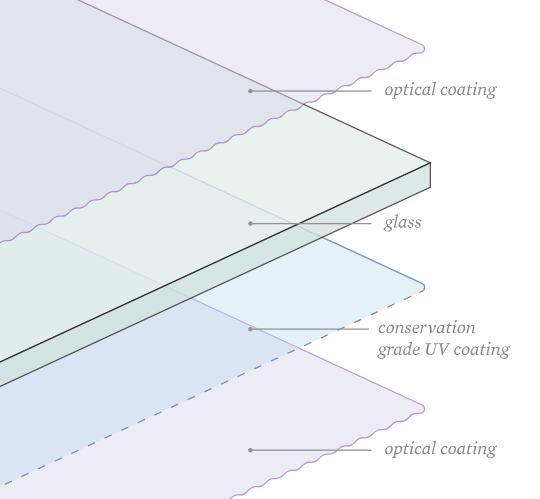 Whilst not offering a UV filtering level as high as specifically made UV filtering glass, Ultra-Clear glass does offer a higher level of UV protection than standard glass. It’s main feature however is its virtually non-reflective nature. In the past diffused glass was used to achieve this, however that left the images beneath looking somewhat cloudy and distorted, with modern Ultra-Clear that is no longer the case, the glass is covered with a double-sided layer of optical coating, give a clear and unadulterated view of the framed image. Ultra-Clear glass is perfect for dark pieces, as dark pieces tend to reflect quite a lot of light when placed under regular glass. Particularly bright and finely detailed pieces also benefit greatly from the clarity of Ultra-Clear glass as it allows image to be displayed in its least distorted form, providing the viewer with a clear and accurate image. The holy grail of glass. Museum glass is the combination of UV and Ultra-Clear glass. It offers both 99% UV filtering and cuts out virtually all reflection. For pieces of great monetary and personal value which are intended to be proudly displayed, this is the best choice. This is the highest quality grade of glass available in picture framing, and as its name suggests, is the very glass opted for by high end museums and galleries. As outlined above there are a variety of different types of glass, to suit a variety of different needs. Check in with us at Art & Frame to discuss which glass would best suit your piece and your needs.